Hancock, Mich. - The Lake Forest College women’s hockey team, ranked 10th in the nation, traveled to Finlandia over the weekend (November 17-18) and returned with three points in the Northern Collegiate Hockey Association standings. The teams skated to a 2-2 tie Friday night and the Foresters held on for a 5-4 victory on Saturday. Lake Forest is now 4-0-2 overall this season while the Lions fell to 3-3-2. They were the first league games for both schools. Finlandia scored Friday’s first goal while on the power play at the 15:55 mark of the opening period. The home team doubled its lead with another score at 7:12 in the second. The Foresters came back on power play goals by junior Courtney DeHoey (Chatham, Ont./Bluewater Jr. Hawks) at the 2:24 and 16:08 marks of the third period. Classmate Jen Clouthier (Aurora, Ill./Chicago Mission) assisted on the first score and fellow junior Allison Rushing (Seattle, Wash./Seattle Admirals) on the second. 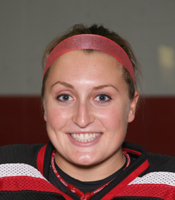 Senior Sally Bevis (Huntington, N.Y./North American Hockey Academy) recorded 25 saves in the contest and is now 1-0-2 on the season with a 1.92 goals against average and .915 save percentage. Freshman Ryann McCarthy (Lombard, Ill./Team Illinois) was between the pipes on Saturday, stopped 27 Finlandia shots on goal, and recorded her third victory in as many appearances. DeHoey started the scoring on Saturday with a power play goal at 8:18 in the opening period. She was assisted by Rushing and senior Katie Snowden (Toronto, Ont./Willowdale Redwings). Snowden then scored her second goal of the year at 11:09 and freshman Maggie Bresser (Fond du Lac, Wis./Waupun H.S.) extended the visitors’ lead to three goals just 23 seconds before the first intermission. Rushing assisted on Bresser’s first career goal. Finlandia fought back and tied the score with three goals in the first eight minutes of the second period. DeHoey then put Lake Forest ahead for good with her second goal of the game, fourth of the weekend, and team-high seventh of the season at 12:26. Snowden assisted DeHoey’s fourth power play goal of the weekend and sixth of the year. Clouthier added what turned out to be the game winning goal at 14:21. Snowden and Rushing assisted on the score to finish the weekend with four points apiece. After taking Thanksgiving weekend off the Foresters will be back in action the following Friday and Saturday (December 1-2) at home against fellow NCHA foe UW-Eau Claire.